Description: Cheesecake flavor perfect for dipping your favorite fruit. A sweet profile with dairy, and some sour notes. 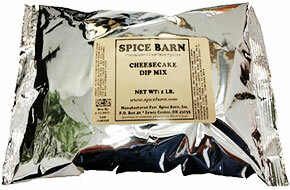 Usage: Blend 8 ounces softened cream cheese with 1/3 cup sour cream and 3 tablespoons dip mix. Mix well; chill for at least 1 hour. Add additional mix for stronger flavor. Ingredients: Sugar, Natural Cream Flavor, Cream Cheese (sodium caseinate, disodium phosphate, natural flavors, BHA), Whey, Milk Powder, less than 2% Silicon Dioxide added to prevent caking. ALLERGEN INFORMATION: CONTAINS MILK. Bring cream cheese to room temperature; using back of fork combine with remaining ingredients but do not over beat. Chill. Wash berries and drain. Hollow stem end with apple corer to make pocket. Drain upside down until dry. Using pastry bag and star tip, pipe cheese cake mix into strawberry. Sprinkle top with shaved chocolate. Chill until ready to serve. These may be served lying on their side on plate, or cut a small amount from the bottom of the strawberry to stand upright. *Shaved Chocolate: using a milk chocolate candy bar, grate with fine grater.